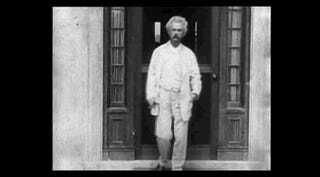 Mark Twain was one of the most famous Americans who ever lived, yet the iconic film of him walking around his home in Connecticut is the only footage we have of him. Now, thanks to the restoration efforts of TFG Film & Tape, this invaluable footage has finally been given the treatment it deserves. The silent film footage was taken at Stormfield in 1909 by the Thomas Edison Company. Twain died the following year at the age of 75. And here it is after the restoration (sadly, TFG has disabled video embedding). To do it, the TFG restoration team flipped the image from left to right to correct the camera-to-subject orientation. The speed has also been corrected; frame-rates at the time made the footage appear faster than normal. The detail was enhanced to bring out previously obscured visuals, and the fluctuations in the exposure have been reduced to make the image easier on the eyes.